Very very Chianti-Classico-like wine is not Chianti Classico!? MONTEVERTINE and MONTEVERTINE's LE PERGOLE TORTE are the best Sangiovese from Radda in Chianti. Although its taste embodies terroir of Chianti Classico and Sangiovese, those wines are not classified as DOCG Chianti Classico. Tignanello, Sassicaia, and Ornallaia are well known as an original Super Tuscan which are made of Bordeaux grape varieties such as Cabernet-Sauvignon and Merlot, or blend of Sangiovese and Bordeaux grapes. Indeed, these wines are out of criteria of DOC Italian wines in 80's. On the other hand, MONTEVERTINE and LE PERGOLE TORTE are made from Sangiovese in Radda in Chianti. Why they are not DOCG Chianti Classico? Because when they started producing wine, they could not produce Chianti by red grapes only(10% of blending of white grapes was must for Chianti wine). However Sergio Manetti had recognized great potential of Sangiovese and he was convinced that the wine could be better by only red grapes. So he left from Consorzio Vino Chianti and went his own way. MONTEVERTINE created another type of Super Tuscan which is made from 100% Sangiovese. In 1996, the DOC regulation had been changed. Chianti Classico obtained its DOCG individually, and wineries were allowed to produce Chianti Classico by only red grapes or 100% Sangiovese. But MONTEVERTINE didn't come back to DOCG Chianti Classico. We can see the spirits of independency and non-compromise in wine of MONTEVERTINE. These wines are not easy-going and they are a bit stubborn and delicate. However, we would say drinking best condition of MONTEVERTINE is something special in our life. The masterpiece of guru "Giulio Gambelli"
Since the first vintage, Giulio Gambelli has been taking care of wine making of MONTEVERTINE. Gambelli selected client very carefully. Other works are SOLDERA, POGGIO DI SOTTO and LA PORTA DI VERTINE. *We carefully carried these bottles from Toscana by reefer container(boat) and reefer truck as usual. >>>Details of transportation. - Aged in Slavonian oak barrels for 24 months. - Aged in Slavonian oak barrels for 18 months and for 6 months in Allier oak barriques. - Produced in good year only. - Art labels are painted by Alberto Manfredi(every vintage has different label). Le Pergole Torte isn’t a great Tuscan or Italian wine. It is simply one of the world’s elite wines. Montevertine is located in Radda, one of the coolest, highest-altitude spots in Chianti Classico. When I visited last April, the vineyards were noticeably more backward in their development relative to what I had seen in the other parts of the region. Le Pergole Torte was a groundbreaking wine when it was first conceived by proprietor Sergio Manetti in the early 1970s. At the time, Chianti Classico regulations obligated producers to include white grapes in their wines. Manetti dreamt of something else, a wine that would explore the greatness of Sangiovese. Along with noted oenologist Giulio Gambelli, Manetti created Le Pergole Torte, one of the first 100% Sangioveses made in Chianti Classico. Because it was made outside of appellation laws, the wine carried the humblest of all designations, ‘Vino da Tavola’ But the wine itself was fabulous, and the public soon caught on. In 1990 Manetti bottled a wine that would become an icon, the 1990 Riserva, which was an absurdity on paper, given the inherent contradiction of the terms ‘Vino da Tavola’ and ‘Riserva.’ To add to the irony, years later the Chianti Classico laws were updated. The obligatory use of complimentary white and red grapes was abolished, which meant Le Pergole Torte could be a Chianti Classico, but Manetti never returned to the appellation that had snubbed him. One of the misconceptions about Le Pergole Torte is that it is a single-vineyard wine. That was true of the early years up to the late 1980s. By 1990 Pergole Torte had become a selection of the estate’s best fruit across several parcels, although it wasn’t until 2001 that the fruit was sourced from the same basic complement of vineyards that is used today. Sadly, Sergio Manetti passed away in 2000. Manetti’s son Martino took over and adds that he is fully responsible for every wine beginning with the 2001, where he personally made all the decisions. Le Pergole Torte is vinified in cement. The wine is aged for one year in French oak barrels followed by a second year in cask. Martino Manetti isn’t afraid to call them as he sees them. Manetti describes 1985 and 1997 – both heavily touted years – as overrated. For this tasting, Manetti pulled a selection of vintages from his cellar, all based on their personal significance to him. Montevertine lies within the heart of the Chianti hills, in the community of Radda at an altitude of 425 m above sea level. In 1967, Mr.Sergio Manetti bought Montevertine as a holiday house. He restored the house and returned it to its original dwelling destination, and right from the beginning, he planted two hectares of wine and he set up a small cellar. The idea was to produce some wine for friends and customers. The first vintage produced, 1971, was more than decent and Sergio Manetti decided to present some bottles at Italy’s leading wine show, Vinitaly in Verona, via the Chamber of Commerce of Siena. That was an immediate success and Mr. Manetti was so enthusiastic about it that only a few years later he decided to produce wine exclusively. New vineyards were planted, new cellars installed, and that activity has been continued without any interruption. The expansion of their enterprise has been going on until this very moment. After Sergio Manetti had passed away in November 2000, the management of the vineyard is now in the hands of his son Martino Manetti, who is assisted by Bruno Bini, born in Montevertine and an in-depth expert of the zone and the soil. Giulio Gambelli has been their consultant since the first years of the winery. 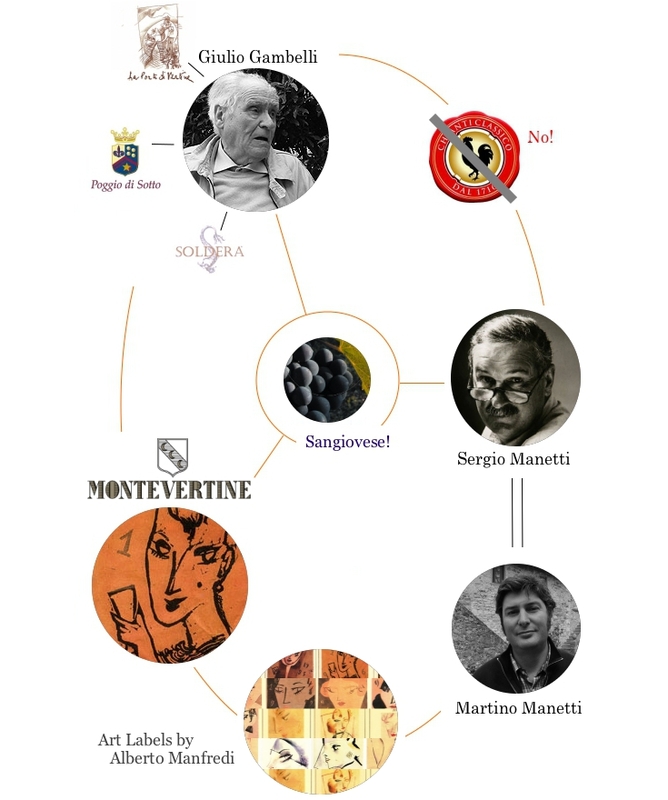 All Montevertine wines were born thanks to his precious help and experience. After his recent passing, his work is now brought on by the enologist Paolo Salvi, following Montevertine's winemaking tradition.